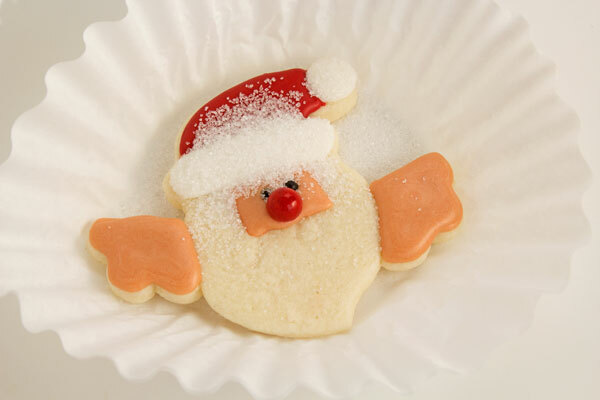 Santa Clause is coming to town and he wants to have dinner with you. 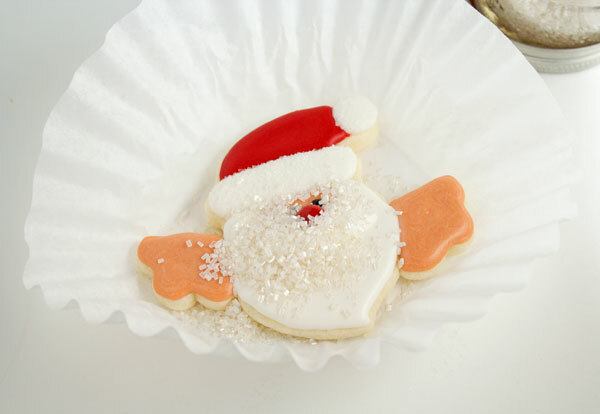 These Santa cookies that hang on a cup will be the topic of conversation at your holiday table and your guests will love eating dinner with the jolly old man from the North Pole. 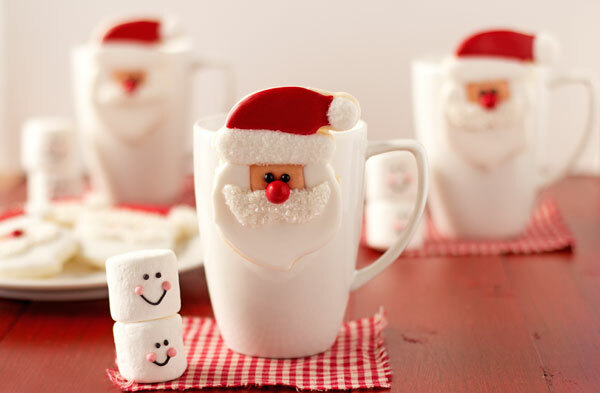 It doesn’t matter if you fill your cups with coffee, hot chocolate or milk for the kiddos just be sure to add a jolly old Saint Nick and watch the conversations begin. When I started this project, I had a different idea in my head but, it just didn’t turn out the way I wanted it to. 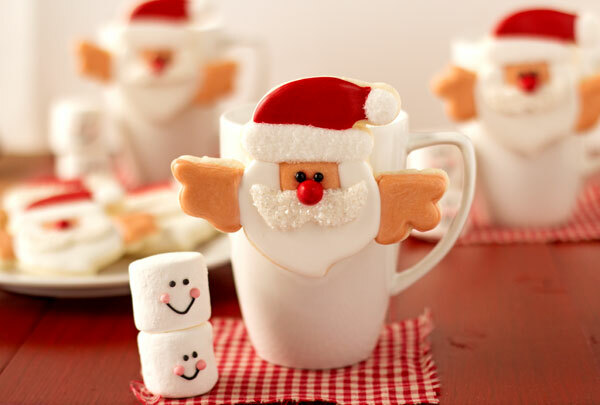 I wanted Santa to look like he is peeking out of the top of the coffee cup. 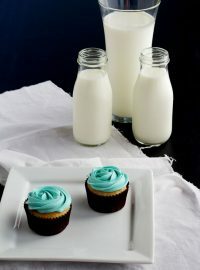 I used a flower cutter to make hands before I baked it but, when I hung them on the cups, they were to low. I like the Santa head without the hands just as much as I like the one with the hands. It is funny how things can change once a project is started. The next time I make these, I will be more careful where I place the hangers. 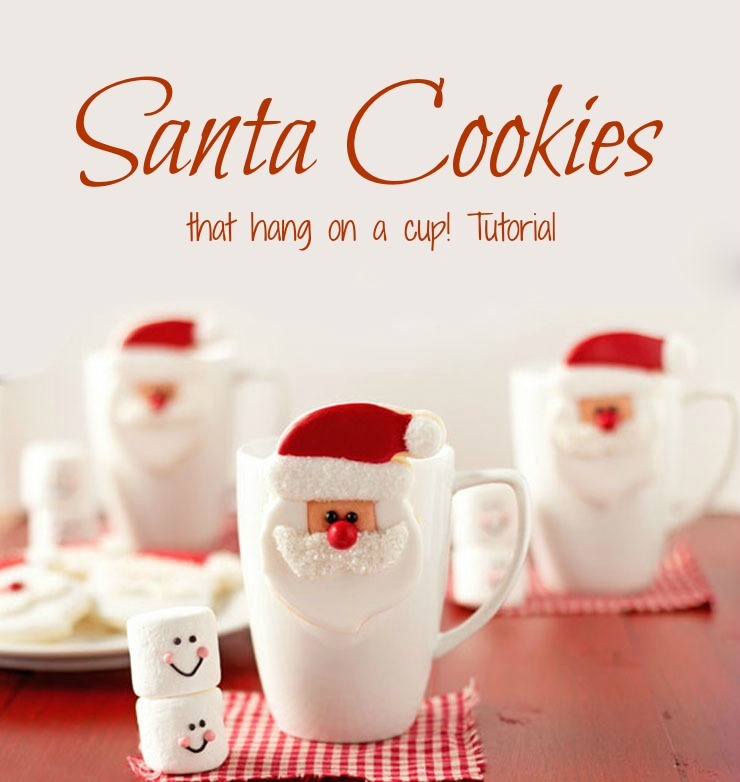 For this tutorial, I will show you how to make the Santa peeking out of the cup. 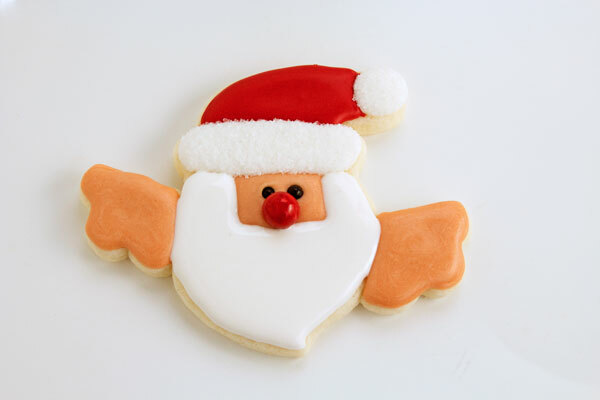 If you want to use a Santa face only, then don’t add the hands. With a food safe marker, outline the hands and the face. Outline and flood them with the flesh colored icing. 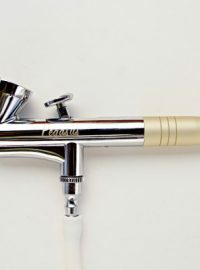 While the face is wet, add the 4mm candy pearls and a sixlet nose. 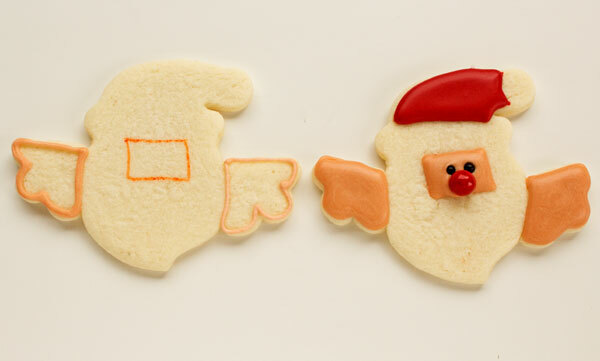 Outline and flood the hat with the red icing and let Santa dry overnight. Next, outline and flood the hat brim and the ball of the hat with white icing. 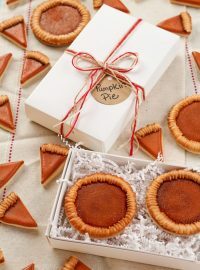 While the white icing is wet, place the cookie into a coffee filter and sprinkle with sanding sugar and shake off the excess. 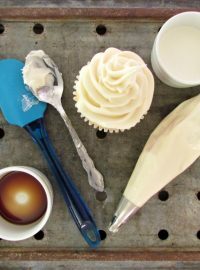 Use a dry paint brush to dust off the remaining sanding sugar. Next, outline and flood the beard with white icing and let it dry for about an hour. 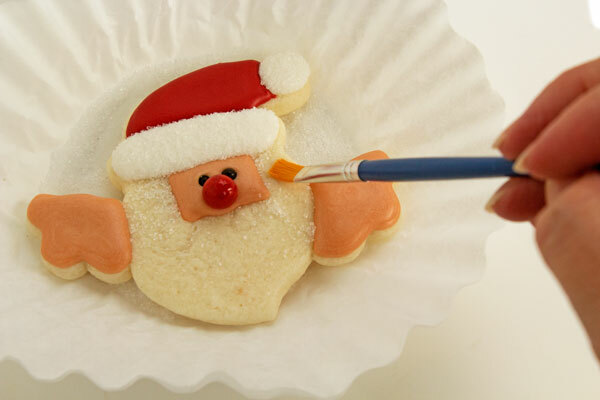 Then, outline and flood the mustache with the white icing and sprinkle with white sanding sugar or white sugar crystals. You can use either one but, I like the look of the sugar crystals for a cute little mustache. Let this dry completely before you add the hanger on the back. For the tutorial on how to add the hanger go to Mike at Semi Sweets Father’s Day tie cookies. 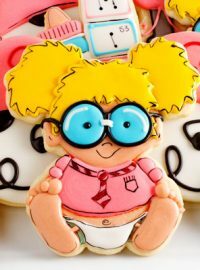 I am in awe of these cookies and his creativity! 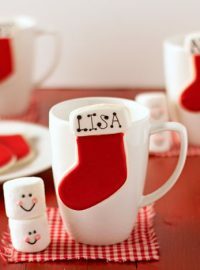 That is what inspired Santa and these Gingerbread Men Coffee Cup Cookies and these Stocking Place Card Cookies. I hope Jolly Old Saint Nick can join you for dinner this Christmas. I can’t even say how much I love these, Lisa! They are just fabulous!